Heated fitted mattress pad for a California queen size mattress 60 inches by 84 inches. Easy to use heat control has ten heat settings for exact control. Dual heat controls to regulate each half of the bed included. Quick warm up. Quiet operation. Automatic shut off after ten hours. Radiant from below relaxes tired back and legs, includes deep, restful sleep all night. Awake revitalized. Pre-warm bed. Drives out dampness. Keeping people warm since 1939 and improving all the time. Save energy! Turn your house thermostat down but stay toasty in bed! Built like a mattress pad so it's out of sight. The mattress pad that the heater is built into is not water proof. The heated mattress pad is made of two sheets of fine weave, pre-shrunk poly cotton cloth, quilted together with bonded polyester fill in between. 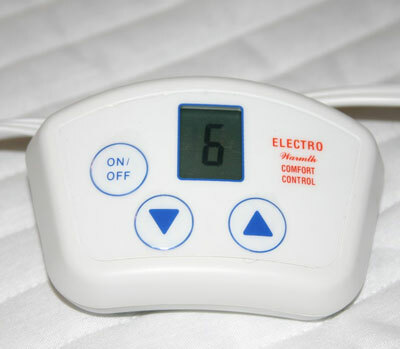 Your Mattress Pad or Mattress Protector can be placed over your Heated Mattress Pad. Control 6 foot 8 inches to electrical plug and 12 foot from heated pad to control. Plug into a normal house electrical outlet. 95% of our orders ship in 5-10 business days plus standard ground transit times depending on your location.